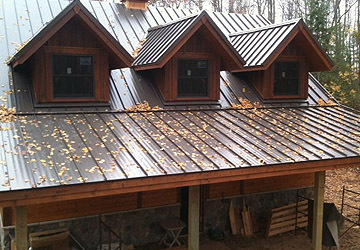 A growing trend in the Northern Michigan climate has been the installation of metal roofing. Beautiful, long lasting, durability is what a metal roof provides, and our expert staff can deliver this to you. We install several manufacturers of metal roofing including ATAS, Fabral, and Metal Sales roofs. All metals are offered in a wide variety products including Standing Seam, Batten Seam and ribbed panels and are available in 24 and 26 gauge panels. Though the metal roof is a superior material, we know that it is only as good as the installer who puts it on. Our staff is well equipped with the knowledge, experience and expertise required to install a quality roof. Take a look at our work, it should speak for itself. 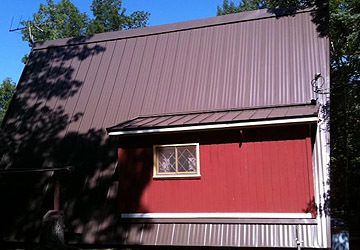 Whether your home, office, or pole barn, a steel roof is sure to last you many years. Norm’s Roofing & Siding houses our own custom metal fabrication shop. All of our flashings are bent and assembled in our shop to fit the given application. For all roofing projects we bend our own open valleys, step flashings, and counter-flashings. In addition, we also fabricate chimney caps, copings, edge metal, and accessories for you home or business. Copyright © 2016 Norm's Roofing & Siding. All rights reserved. Site by Abuzz Creative.